A whistleblowing trainee solicitor who was “deceived, pressured, bullied and manipulated” by a senior lawyer has been struck off the roll. Emily Scott, who left Lincolnshire outfit De Vita Platt Solicitors in November 2014, was handed the sanction despite being the one to bring the misconduct at her firm to the regulator’s attention. While expressing “considerable sympathy” for the young rookie, the tribunal found Scott had acted dishonestly in matters concerning client funds and that her misconduct was “deliberate, calculated and repeated”. Two qualified lawyers who ran the firm — Jonathan De Vita and Christopher Platt — were also struck off for falsifying bills, misappropriating client funds and misleading the regulators. Citing last year’s High Court ruling in the well-publicised Sovani James case, the tribunal said the fact Scott was “under pressure and working in a horrendous environment” could not excuse her dishonesty. According to the judgment, the trainee’s dishonesty continued for several months and she waited for up two years before blowing the whistle — two months after she’d completed her training contract and had left the firm. Scott admitted falsifying bills and failing to initially report the misconduct, but told the tribunal she feared jeopardising her training contact and had acted “under duress”. In mitigation, Scott said she was now self-employed and had no intention of working in the legal profession again. Moreover, she told the tribunal she had been “under the instruction of Mr Platt” and had been on medication during the final year of her training contract. Noting in mitigation that Scott had been “deceived, pressured, bullied and manipulated” by Platt, the tribunal ordered she be struck off the roll and pay costs of £2,077. The firm’s former partners were ordered to jointly pay in excess of £143,000. You can contact LawCare by calling 0800 279 6888 in the UK or 1800 991 801 in Ireland. themselves to a four figure sum. The SRA reputation continues to plummet as they profit considerably from the misfortune of others. One wonders how many other similar unfortunate cases there are out there to be reported on? How can these costs even remotely be justified? A lengthy investigation complicated by the fact that both Jonathan de Vita and Christopher Platt tried to put the blame on the junior solicitor for wrongdoings that only they benefited from. I expect the costs in the criminal case, which has its first hearing at York Crown Court on 11 February, 2019, may well dwarf those costs incurred by the SRA. They cover different facts to the SDT case and involve a non-regulated law firm set up by De Vita and Platt and its involvement in withdrawing monies from trusts set-up to avoid care fees. Jonathan de Vita and Christopher Platt are both charged under S.993 of the Companies Act (2006) for fraudulent trading (maximum sentence 10 years) and Laura de Vita (wife of Jonathan and a non-solicitor) is charged under the Proceeds of Crime Act (up to 14 years in prison) There are four other defendants, including a non-practicing solicitor. Great job on the SRA’s part for ensuring people will think twice (and thrice) before blowing the whistle on fraudulent firm activity in the future. In many sectors there’s protection for the whistle blower. If the SRA expect people to report and then go down with the ship, you’re going to see (hear?) far fewer whistle blowings after this case. These guys are top jokers. What a farce. Because you’re not the real me! The real me would use his full title!!!!!! His full title being wanker. His Holiness- may I commend you on a most elegant exposition of your title. Oxen, BCL (Hull) and CSJM are all master strokes of comedy genius. Give yourself a Perrier Award while you are about it. This decision is beyond inhumane. I agree with the general principle: that dishonesty should result in a strike-off save in exceptional circumstances. However, given this decision and the recent decision in SRA v James, one can’t help feeling that decision makers are now defining ‘exceptional circumstances’ so narrowly as to render it all but meaningless. I qualified with a firm that was engaged in a massive legal aid fraud, definitely bigger than the Blavo & Co one, and they probably still are doing it. The SRA still don’t know about it. I considered blowing the whistle but then I wouldn’t have qualified. If you look at the photo in the article you will see two notices on the door of the former DeVita Platt offices. One of those notices is the intervention notice attached to the door on 19 January 2018. The second notice appeared on the door some months later and was from a local Solicitors practice informing Jonathan De Vita and Christopher Platt that they have no right of access into the property. Jonathan De Vita and Christopher Platt are now facing charges of fraudulent trading. There are five other defendants. 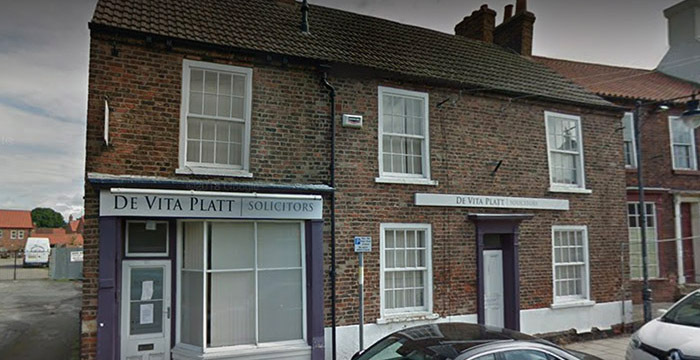 Including a non-practising solicitor who also trained at DeVita Platt. A pre-trial hearing is due to be heard at York Crown Court on 11 February 2019 @ 10am. The costs of the SDT are staggering. All my fast and multi track cases are subject to the proportionality principle. If they proceed to provisional or detailed assessment then reductions are applied. Why is it that the costs presented at the SDT are always so substantial? A lot of these cases tend to involve people falling on their sword with admissions of wrongdoing so it’s unlikely there is a high level of time required to investigate. The two partners attempted to lay the blame of their wrongdoing on the newly qualified solicitor who blew the whistle on their activities. That resulted in a lot more investigation costs plus the the intervention costs of course. Really disappointing result. I think in the circumstances the scalps of the two partners would have been sufficient. It hardly encourages whistleblowing if you end up just getting stabbed in the back. There is a tenuous link between Alan Blacker and De Vita Platt. Alan Blacker was once associated with Gary Beaver, another fake Lord. Gary Beaver was a director of the Society of Will Writers but got kicked out. The non-regulated law firm set up by Jonathan de Vita and Christopher Platt has, within the last two weeks. has also been kicked out of the Society of Will Writers along with all its employees with no notice whatsoever and at zero cost. Just how long did it take the SRA/SDT to get rid of De Vita and Platt and at what cost? Can I be selling you Sir top quality incontinent poobag? Also being available Sir top quality rubber incontinent trouser! Just Whistleblow via the SRA Red Alert Service – that is anonymous. Christopher Platt’s fiancee is also a solicitor at a law firm in Grimsby, trained and specialising in Criminal Law. Platt’s fiancee trained in criminal law but specialises in conveyancing. Shocking treatment of a whistleblower.